So apparently this is what happens when I try to read two contemporary Irish fiction novels written by authors who have been Booker Prize contenders in a row: I get so depressed that the only thing left to do is read the book that is currently number one on the Amazon best seller lists for sci-fi, fantasy, and supernatural books. I started Colm Tóibín’s lovely Nora Webster on Sunday, shortly after finishing The Temporary Gentleman and writing the bulk of my blog post about it. I got four percent of the way through it (another Kindle book), and decided I just couldn’t do it. I’ll go back to it soon, but I needed something a bit less heavy than the story of a forty-year-old woman coping with the death of her husband and having to raise their four children on her own. All coupled with detailed descriptions of the glorious weather the Irish are known for. Truly, I think I’ve read more descriptions of rainfall in 2015 than in any year prior. 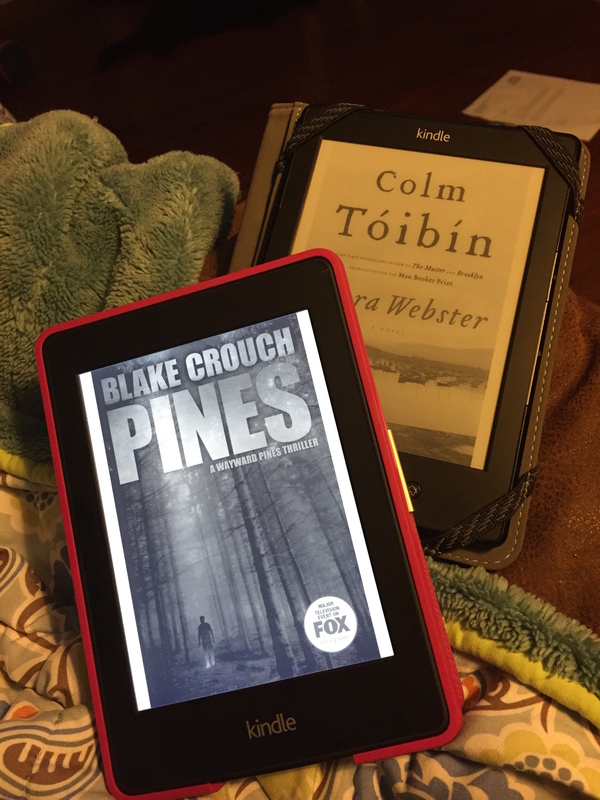 So I picked up my Kindle, and started reading Pines, the first book in a sci-fi/fantasy/horror/mystery trilogy by Blake Crouch. I first learned about this series about six months ago when one of my coworkers was reading it. She reads a lot of popular fiction along the same lines as the stuff I enjoy, so I believed her when she said I’d like it. Put them in my Amazon cart, and thought about them. Then, when I got my new Kindle and my free month trial of Kindle Unlimited back in February, I saw they were available to borrow there, so I put the first one on my Kindle. Read the first chapter on a road trip a couple weeks ago and knew I’d be getting back to it sooner rather than later. So it made perfect sense that Pines would be the book I used to break up my Irish fiction fest. This is also the second book I’ve read on my own Kindle, which is weird. I’ve read more books on my boss’s Kindle than on my own. As an aside, I must say, I do like having the back lighting on my Paperwhite, though I kind of prefer having a button to push to change pages like on her Kindle as opposed to just touching the screen. I understand why the Voyage, latest e-ink Kindle, has both, though I don’t think it’s worth paying about eighty bucks more to get it. But I digress. Wayward Pines is, as you may know, currently airing on Fox as a summer series starring a bunch of famous people. I’m not watching it, because I wanted to read the books first, since I knew in advance that they rely fairly heavily on suspense and surprise, but after finishing the first book I definitely want to see how it’s been adapted for TV. The protagonist is Ethan Burke, a Secret Service agent who winds up in Wayward Pines, Idaho, when he is sent there to find two missing agents, one of whom happens to be his former partner/lover, Kate Hewson. The book opens with Ethan waking up next to a river, wounded, with no idea who or where he is. He wanders into town, gets into some trouble, passes out, wakes up in the hospital, and by some miracle knows who he is and remembers how he ended up in Wayward Pines. Right away, he knows something isn’t quite right with this tiny town and its residents. He can’t get ahold of his wife or his boss, and the sheriff is variably hostile, depending on what antics Ethan gets up to around town. And let me just tell you, he gets up to a lot of antics. I really, really want to avoid plot summary as much as possible since there’s so many twists and turns and to do too many spoilers will ruin the tension that Crouch does such a good job of fabricating, but it’s going to be hard since this book is 95 percent plot. There was never a dull moment in Pines. It’s practically perfectly crafted to hold the reader’s attention. When there is an occasional lull in present day action, Crouch takes those opportunities to give us some of Ethan’s backstory, or to introduce us to his wife Theresa and his son Ben and what they have been up to since Ethan disappeared. The characters aren’t especially well-developed with the exception of Ethan, though there isn’t that much there, either. We know that Ethan was a Black Hawk pilot, and briefly a POW, in the second Gulf War, and that he was tortured by someone named Aashif. We know that he loves his wife and feels terribly that he hurt her when he had the affair with Kate Hewson. But I don’t really feel like I know these characters on any deep level. Honestly, after reading four percent of Nora Webster on Sunday I felt like I knew her better than I do after finishing three whole books about Ethan Burke. But that wasn’t really the point of the Wayward Pines series. The point is action and suspense and a smattering of gore. For example: towards the end of Pines a “fête” is held in “honor” of Ethan. A fête is how undesirable elements are dealt with in Wayward Pines. They are led by the sheriff, and the townsfolk, including the kids, get dressed up like it’s Halloween, and chase down and murder whatever person has been deemed to be a problem. It’s pretty awesome. Or something. I will say that most questions regarding the origins of Wayward Pines and why there is a giant electric fence surrounding it and why the road out of town is also the road into town are answered by the end of the book. 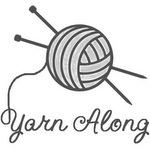 It’s a pretty clever, and I’m going to get into all that when I review the next two books in the trilogy (both of which I finished since starting to write this post on Wednesday), but I thought I’d leave this review fairly spoiler-free. I won’t be so kind in my next two, because there’s no way to talk about Wayward and The Last Town without spoiling the big reveal at the end of Pines. I definitely enjoyed Pines, though I’m not sure people who aren’t fans of this sort of book would enjoy it. Occasionally there were beautiful passages describing the geography of Wayward Pines, and there was one passage in particular describing Ethan’s feelings for his wife (or hers for him) that was quite lovely. I’ll be posting about the next two books in the trilogy over the next few days, so stay tuned! I agree 100% about the buttons on Kindles being a better way to turn the page. I’ve been wishing I got another regular Kindle instead of a Paperwhite.